Futures are pointing towards a bounce in the market. 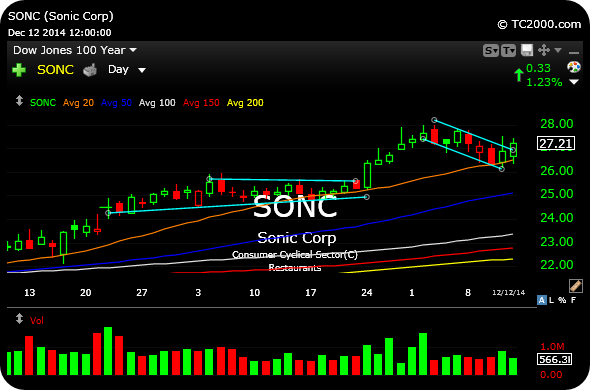 If that holds, SONC is a long idea on strength over $27.50. On the first daily chart, below, the fast food play has been in a potent uptrend for a while now, basing well above all major moving averages. But if the broad market bounce fails to hold and the selling resumes, then I still think major airlines, such as UAL, seen on the second daily chart, are likely to follow-through lower to Friday's bearish reversals. The yellow arrows denote the bearish engulfing candlestick.